Shirts With Random Triangles: Four-Star OT Prospect Kai-Leon Herbert Commits To Michigan's 2017 Recruiting Class. 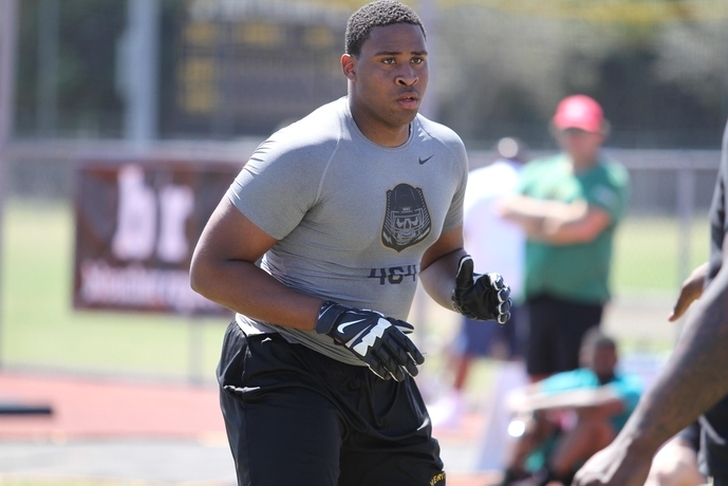 Four-Star OT Prospect Kai-Leon Herbert Commits To Michigan's 2017 Recruiting Class. Kai-Leon Herbert. Image via villagessuntimes.com. Michigan has added an eighteenth member to its 2017 recruiting class. Fort Lauderdale, Florida high school rising senior offensive tackle Kai-Leon Herbert committed to the Wolverines on Wednesday. 247Sports.com grades Herbert as a composite four-star offensive tackle prospect. The recruiting website ranks Herbert at no. 22 among 2017 OT prospects, at no. 32 among 2017 prospects from the state of Florida, and at no. 166 in its national composite rankings for 2017 prospects. Herbert attends American Heritage High School in Plantation, Fl. He strands 6'5, and weighs 284 lbs. The Detroit Free Press reports that Herbert will be attending Nike's The Opening Finals this weekend in Beaverton, Oregon.